After Mario's forays into non-platforming genres, such as Mario Kart, Mario's Picross and Dr. Mario, Nintendo realized something: Whatever you put Mario in, it will sell. Soon after, they made loads of Mario sports games - Starting with Mario's Tennis on the Virtual Boy, Nintendo soon made the plumber try golf, and, more recently, baseball, football (Soccer for you Americans) and even Dance Dance Revolution! Mario Golf was the first Mario sports game on a console. After Mario's Tennis on the Virtual Boy flopped bigtime (It's not hard to figure out why) Nintendo decided to give Mario another shot. Thankfully, they succeeded this time. Mario Golf is, well, pretty much what you'd expect - Golf. There is a number of different clubs to select (Lighter ones knock the ball further), including a few made specifically just for getting out of tight spots, like bunkers. After selecting a club and beginning your swing, a power bar will appear. A small marker will appear near the right and start going left. Press the A button when it's as close to the far left as possible to swing as hard as you can and it'll start going back right - Then you need to stop it as close to where it originally started as possible (This isn't the far right). The closer you are, the more accurate your short will be. Practice getting this right on! You will also need to pay attention to the strength of the wind, which could send your ball way off course if you don't adjust your shot. In true Mario version there is an extra gameplay element: Aside from being able to select an "Approach" shot (To get the ball on the green when you're close, but not quite there), you can select a "Power" shot, which makes the ball fly extra far. When you start a course, you will only have 6 Power shots at your disposal - However, if you use one and then get a "perfect" shot (Stopping the marker at full power and perfect accuracy) your Power Shot will not be used up and the ball will fly even further, accompanied by a special effect depending on the character (Such as Mario's ball becoming engulfed in flames). If you're only slightly off, however, you will not gain the extra distance and lose your Power shot. Once they're all gone you'll have to rely on normal shots! What is quite strange is that this is one of the few Mario games with non-Mario characters - Most of the roster consists of Mario characters, but there's also a bunch of newly created human characters, such as Charlie, Harry and the most well-known one, Plum. Another strange thing is that you only have access to four characters at the start - Baby Mario, Peach, Charlie and Plum. In order to unlock everybody else (Even Mario!) you have to beat them, one by one, in the "Get Character" mode. Don't expect this to be easy - The AI is actually quite rough on you. Unfortunately, because you unlock the characters in a specific order, that means that the game is just not balanced - The starting characters' maximum drive distance lingers around 200 yards, but the final characters can all hit over 300, meaning that once you unlock them, there's absolutely no reason to use the old characters, unless you want to lose. The only other stat that matters is the characters' shot type - Some shoot the ball straight, but others have a "Draw" or a "Fade", meaning the ball will go right or left, respectively, and then curve back to the middle. This means you have to be extra wary of large obstacles such as trees, but all in all, it doesn't really make a big difference. The game has a ton of modes to test your skills in - Aside from the above-mentioned Get Character mode, there's a Tournament mode, Mini-Golf, Ring Shot (Shoot the ball through floating rings), Speed Golf (Like a time attack mode) and a variety of versus modes, such as Stroke Play (Player with the lowest score wins), Club Slots (Before each hole you spin a slot machine, which selects a mere 3 clubs for you to use) and more. Sadly, if you're looking for a Mario-ized golf game here, you will be disappointed. Aside from the final course, which has holes shaped like Mario characters, each area is really quite normal and does not have special Mario-esque obstacles to avoid. But if you don't mind that the game is actually quite realistic, you can do no wrong here. Just be aware that unlocking all characters (Which you will want to do) will be a long and hard task! NOTE: The original version of the game could be linked to the Game Boy Color version to unlock some additional characters. The VC version lacks this functionality, meaning you do not have access to the extra characters and will always have to stare at four empty character slots on the character select screen! 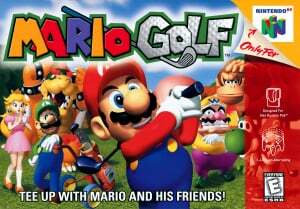 Great game, whether you're a Mario fan or a Golf fan. I simply can't decide if I should get this or not. I'm having a hard time, actually. I remember being confined to a hospital and this game being there and I remember it was fun. I have Toadstool Tour but I don't like it too much. It got a bit... underwhelming later on, IMO. But I have such fond memories of this. I just don't know! Toadstool Tour is a better game than this - Mario Golf feels a little bare-bones in comparison to it's sequel. If you don't enjoy the GameCube iteration, I doubt you'd enjoy this. The fun you had with it probably stemmed from the context you played it within. Bare-bones is where it's at, as long as the gameplay is up to par. @Roo: Maybe so but still... I can't help but feel that maybe I should give this one the benefit of the doubt. The 4 slots wouldn't have to remain empty if N decided to use the DSi for GB games emulation, & retroactively fixed the connectivity of games like this. But I doubt they'd do that, as it's more profitable to release newer versions for these series. I know this is golf, but I personally like the N64/GBC Mario Tennis, & to some extent, the N64/GBC Mario Golf pairs better, than their successors. I only liked the mini-golf on the N64. The rest was just "What do I do?" I am ashamed to say that I have never played an N64 game. @VirtualConsoleGuy You should be ashamed of yourself. This game rocks. It's a great game to play with friends.